The government’s press office sent its answer to the question posed by Bivol to Bulgarian Prime Minister Borisov Borisov asking him whether he sees a conflict of interest in the case with Vladislav Goranov’s apartment, in view of the fact that Hristo Sariev, a son of the family that provided the apartment, has worked at the Ministry of Finance at the time Goranov was already Minister of Finance. We recall that Ivan Sariev is Vladislav Goranov’s godfather and provides him with a rent-free apartment of 181 square meters. 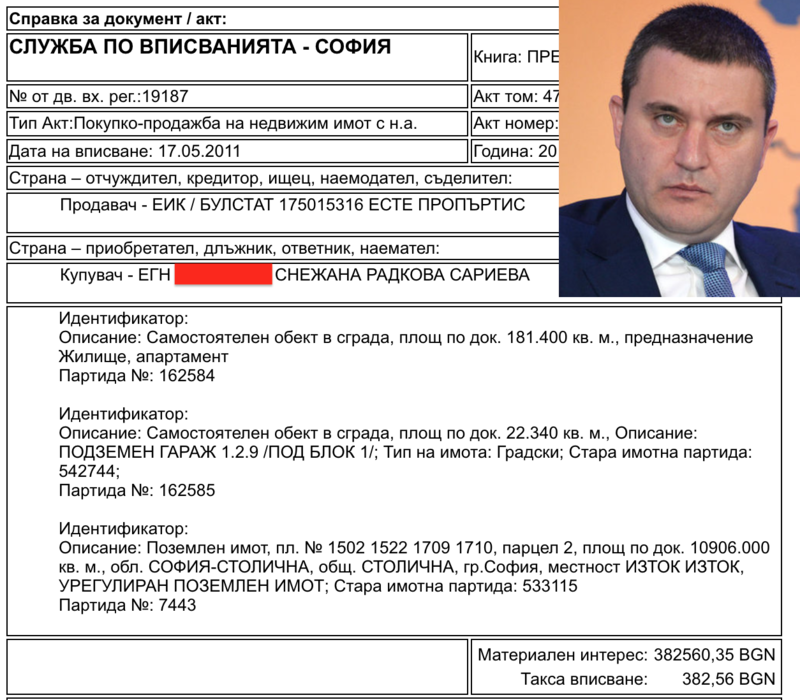 Bivol revealed that the apartment has been acquired by Sariev’s wife for BGN 382,560. Goranov had been living there since 2012 but did not declare the rent-free fact until this year. Bivol also revealed that in 2015 Ivan Sariev’s son got a job at the Ministry of Finance and has participated in a committee deciding on the winning bidder in a public tender. In its answer, the government’s press office explains that the Ministry of Finance has nearly 600 employees and whether there is a conflict of interest can be established by the Committee for Combatting Corruption and the withdrawal of illegally acquired property (KPKONPI) (sic) to which the probe has already been assigned. Hristo Sariev worked at the Ministry of Finance as a junior expert in the Directorate “Economic and Financial Policy”, Department “Institutional Law” from February 9, 2015, to December 27, 2015. The main functions of the “Economic and Financial Policy” Directorate include providing analytical support and policy coordination and effective representation of the Ministry of Finance and executive bodies in economic and financial matters within the European Union as well as development and improvement of macroeconomic models for forecasting and analyzing alternative scenarios and analyzing the long-term equilibrium and for assessing the impact of the implementation of national and European strategists Cesky documents. The “Institutional Law” Department has carried out activities for the successful presentation of the Bulgarian positions within the Council of the European Union on Economic and Financial Affairs (ECOFIN) as well as for the timely and accurate reporting of travel expenses by delegates of the Republic of Bulgaria for the sessions of the working bodies of the Council of the European Union. – activities related to reporting and reimbursement of travel expenses for the participation of officials of the Bulgarian administration in the meetings of the working bodies of the Council of the European Union. It is clear from the above that Hristo Sariev has not been an employee of the Public Procurement Unit at the Ministry of Finance but, in compliance with the internal rules for planning, organizing and conducting public procurement at the Ministry, has participated as a representative of the Directorate, as the subject matter of the procurement has been relevant to it, in a committee for examining, evaluating and ranking submitted proposals under a public procurement procedure by means of a public invitation, with the following subject “Update and Upgrade of a Multifunctional Modeling Tool SIBILA “. Earlier, the Prime Minister called on Goranov from Brussels to provide an explanation about the rent-free apartment. The Minister of Finance told Parliament only that companies owned by the Sarievs had never won any public procurement tenders. Meanwhile, the Prosecutor’s Office is investigating crimes under Art 283 of the Penal Code (PC) / Art 304b PC in connection with Goranov’s free use of the apartment. He, as well as the Sarievs, have been questioned by a prosecutor. The probe has been assigned to the KPKONPI, which has 20 days to issue a decision. However, it is clear from the government’s answer that at least until then, the Prime Minister has no intention of asking for Goranov’s resignation. Vladislav Goranov also rose to fame some time ago over a photo from 2010 in the company of the controversial lawmaker, media tycoon and former head of the National Security Agency (DANS) Delyan Peevski. Goranov was then Deputy Minister of Finance. On media questions about what the two had discussed, Goranov replied that he has had nothing to do with Peevski and that they simply happened to be in the same place at the same time.